Maleficent is the newest Sleeping Beauty movie to come to the big screen, except this version focuses on the villain and not the princess. Vividly reimagined by Disney, Angelina Jolie excels in the role, and the cinematography is simply breathtaking throughout. As a young girl, Maleficent looked very much human, other than the horns coming out of her head and the wings sprouting from her shoulders. She befriends a boy named Stefan, and surprisingly a friendship and later a romance is born. He later leaves her for the humans, though, and eventually winds up in King Henry's court. When Maleficent does wrong by the King, who is now dying, he wants her head on a platter, and offers a tempting deal: anyone who can slay Maleficent and bring her to him will be heir to the throne, and able to marry his daughter, as well. Stefan knows he can coerce Maleficent into spending some time with him, and he goes into the forest to see her. Later, Maleficent is angry at Stefan, and takes out her anger on his new daughter, Aurora: she curses her to prick her finger on a spinning wheel on her 16th birthday, and she will be in a sleep-like death state, unless she is given true love's kiss. Maleficent then gets to know Aurora as Aurora grows up, however, raised by three fairies who call themselves her aunts, and she regrets this curse; by that point, however, it is unbreakable. I saw this film in 3D and the cinematography was amazing; I would assume that in IMAX 3D it would be even more beautiful. The costumes are all very well done here too, and Jolie (with prosthetic cheekbones) looks great, as does Elle Fanning as Aurora. From the three flighty (no pun intended) fairies to Stefan, who later ends up being king, every character is extremely well done here, although more backstory could have been given on some of them. Yes, see this movie, and see it in 3D. There are a few flying sequences especially that make you feel like you are actually IN the film, which was fantastic. There is really nothing I would change about this movie, which is why it receives my first 5 out of 5 stars rating this year. 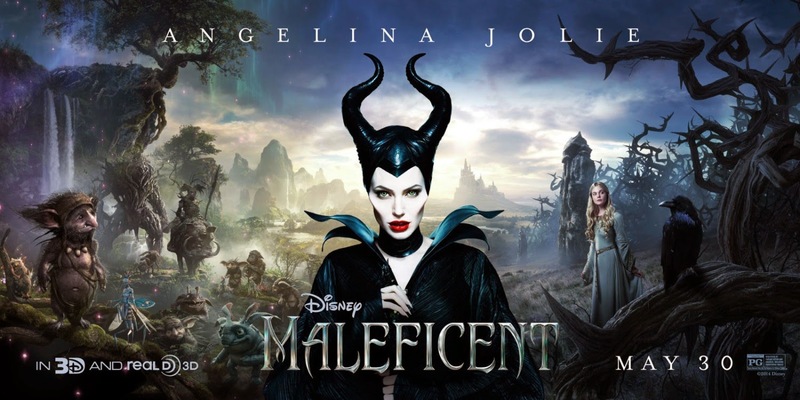 I will say that I was shocked when I saw it was PG and not PG-13, though, as this is maybe the darkest Disney film I have seen to-date; there's no language or anything like that, but definitely some fighting and violence, and Maleficent can be downright scary at times (especially when she's angry!). I'd say this movie is good for kids 10-11+, but I wouldn't bring young children to this one. Otherwise, Maleficent is a movie that everyone should see, and I actually wouldn't have minded it being longer than its 97 minute runtime. Maleficent is in theaters today, May 30th, and is rated PG with a runtime of 97 minutes. 5 stars out of 5. Great write-up, Liz! Sounds like we had some similar thoughts for sure :) I didn't know Jolie had prosthetic cheekbones, but that explains why it took 4 hours to do her make-up! I loved her bright red lipstick and white teeth too -- made her more evil for sure. I believe I read that somewhere - regardless, those cheekbones did NOT look real! Ha. And yes, the red lipstick/white teeth were great too. I think you'll love it! Let me know your thoughts after. 3D is definitely the way to go for this one, too. I want to see it but Hayley is way to afraid to see it! I will go myself! I would've loved it to be a little longer too. I thought it needed more dialogue, but I really loved this film, it was done beautifully! Great review! Yes, it was definitely a beautiful film! And thanks :). I really would LOVE to see this film. The trailers look amazing! Assuming the success of the movie, Maleficent should be making a comeback in ABC's Once Upon a Time, another cross-genre plot twist for Disney. Ha, you are probably right on that. That would be fun, though! I have mixed feelings about this movie! I'm not a huge fan of Jolie, but love fantasy/fairytale movies. It definitely looks like it's geared more towards adults. It looks dark and creepy. But all and all I wouldn't mind seeing it. From your review, it sounds worth it. Definitely worth it - I say it's more geared towards adults, but kids 10+ would probably be okay with it too.